Blowdown is a very important part of any water treatment program. Its purpose is to limit the concentration of impurities in the boiler water. The right amount of blowdown is critical: too much results in energy loss and excessive chemical treatment cost; too little and excessive concentrations of impurities build up. There are no hard and fast rules as to the amount of blowdown because of the variation in water quality varies from place to place. It can range from 1% (based on feedwater flow) to as much as 25%. Total Dissolved Solids – TDS is a measurement of boiler contamination and therefore an indicator of when blowdown needs to occur. Actual TDS is measured in ppm (parts per million). The measurement instrument used is based on the boiler water’s conductivity/resistance. Pure water is a very poor conductor of electricity. Water with a high level of TDS conducts electricity quite well. A very sensitive meter converts the electrical signal to ppm -or- depending on the type of meter – an electrical reading is converted from a meter reading to ppm manually on a chart provided by the instrument’s manufacturer. A common, and much less sophisticated method of TDS “measurement” is a clear-sight-glass that visually indicates the boiler water condition. When the boiler operator sees the water getting dirty, they perform a blowdown. Common practice may be to simply blowdown the boiler at every shift change for a given period of time. This method may or may not be effective and could be wasting energy from excessive blowdown losses of both heat and boiler chemicals. 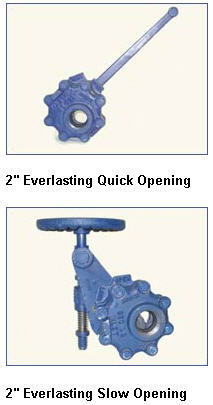 There are two types of boiler blowdowns -continuous and manual. A continuous blowdown utilizes a calibrated valve and a blowdown tap near the boiler water surface. As the name implies, it continuously takes water from the top of the boiler at a predetermined rate. A continuous blowdown is an optional feature and is not included on all boilers. However, all steam boilers must include a means for manual blowdown as standard equipment. Manual blowdowns allow for the removal of solids that settle at the bottom of the boiler. Blowdown should be done with the boiler under a light load. Open the blowdown valve nearest the boiler first. This should be a quick opening valve. Crack open the downstream valve until the line is warm. Then open the valve at a steady rate to drop the water level in the sight glass ½ inch. Then close it quickly being sure that the hand wheel is backed off slightly from full close to relieve strain on the valve packing. Close the valve nearest the boiler. Repeat the above steps if the boiler has a second blowdown tapping. Water columns should be blown down at least once a shift to keep the bowls clean. Care should be taken to prevent low water shutdown if this will affect process load. Be sure blowdown piping is not obstructed. Note: Boilers that operate below 100 psi may have only a single blowdown control valve. In drum-type boilers, the concentration of the water should be controlled by blowdown from the steam drum. Continuous blowdown is preferred. Also in drum boilers, blowing from the mud drum or bottom headers removes suspended solids from the boiler. Trying to control the concentration of impurities by blowdown from this location can cause a severe disruption of circulation in the boiler, causing damage to the boiler. Bottom blowdown should be of short duration, on a regular basis. These are determined by boiler design, operating conditions and the accumulation rate of suspended solids. Fire tube boiler blowdown can be either continuous or intermittent. It can be blown down from below the surface or from the bottom. Type, frequency and duration depend on boiler design, operating conditions and the type of water treatment program. A way to reduce the energy loss is to install a continuous blowdown heat recovery device. These are now economical for blowdowns as low as 500 lb/hr. For information on blowdown heat recovery. Low pressure boilers typically blowdown directly from the boiler to a floor drain. However, even with low pressure boilers the presence of live steam, very hot water and blowing contaminates can be a safety issue. Also, where the boiler drain is connected to a city sewer, local code may require that the blowdown water be cooled to less than 120F before it enters the sewer. This is accomplished by mixing with cold, fresh water. 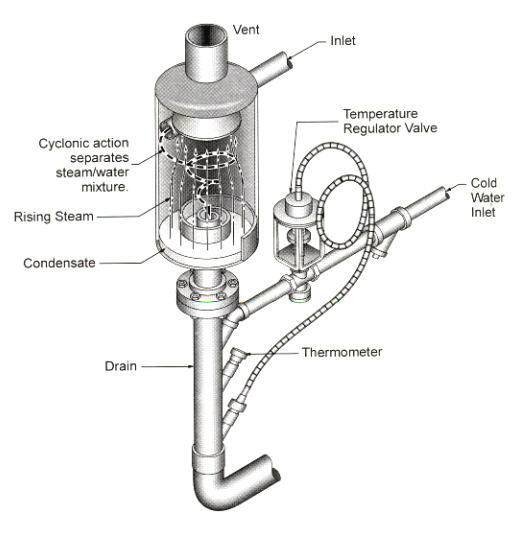 Blowdown separator take water from the boiler during blowdown and reduce it to atmospheric pressure for disposal. The separator accomplishes this by separating the subsequent flashed steam from the hot water. As the blowdown enters the vessel, it is forced into a centrifugal pattern by means of a striking plate. The steam is vented to the atmosphere through a top connection. Separators are built as per requirements Section VIII of the ASME Code and stamped by the National Board of Pressure Vessel Inspectors.